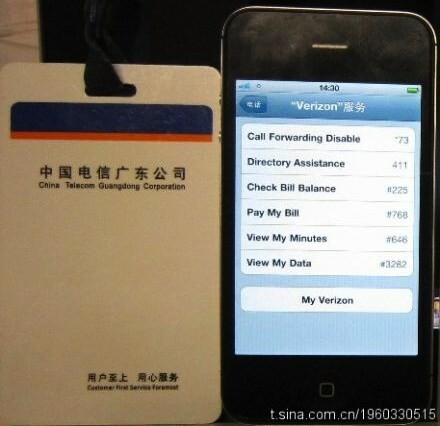 A post signed the “Apple Lab Team” on the Sina Weibo account identified as belonging to the Guangdong branch of China Telecom said Tuesday the “CDMA iPhone 4 has made its first call in China” without a hitch. The only way for a CDMA iPhone 4 to make a call on another network would be if the device had been unlocked, freeing the iPhone from its carrier shackles. WSJ then references a picture of the CDMA iPhone 4 with a Cydia app on the homescreen, but that’s not much evidence considering the Verizon iPhone can be jailbroken using either GreenPois0n RC or PwnageTool 4.2. Those familiar with developing iPhone unlocks have long stated that the CDMA iPhone presents a unique challenge because moving a CDMA device to another network typically requires that new networks assistance in order to activate the phone. This simple fact is also what makes this news from China Telecom most compelling, as it suggests the unlock is being developed directly by the carrier themselves, which would ensure carrier compatibility from the get-go. If China Telecom manages to pull this off, it could represent a blueprint for other CDMA carriers to follow that would allow them to unofficially offer the iPhone 4 on their networks too. An unlocked CDMA iPhone 4 would undoubtedly be popular both in the USA and abroad, we’ll keep you posted to any news. This will work in China because there are no legal ramifications of doing so locally. The USA is another story, if Sprint started openly activating CDMA iPhones on their network I think Apple would be suing them rather quickly. Apple would have no room or reason to sue. Once a phone has been purchased, you can do what you want with it & activate it with whatever carrier you want – provided its unlocked & its on the same network type. CMDA Phones have to be unlocked if the customer asked and have completes his or her contract.. Thats why my mum uses a CDMA Sprint Phone with Cricket Wireless. is it possible to reprogram a Ipad 2 Verizon (doesn’t have slot for sim card) to use with GSM internet provider which sells a sim card for the service? I bought an Ipad 2 3g Verizon (no slot for sim card) and internet service in Ecuador (GSM system) only with sim card. Is it possible to fix the Ipad to work with sim card? um, no. if it doesn’t have a sim card slot, there would be nowhere to put it. i suggest to either find an internet provider thats uses cdma in ecuador and unlocking your ipad (would be pretty hard) or returning your verizon ipad and getting an at t one. Any updates on this issue? I recently got a Verizon iphone 4 (2 months ago) and am moving to China in a couple weeks. Im admittedly uneducated when it come to phone hacks, but is it possible to jailbreak my verizon iphone, take it to china and get on China Telecom yet?